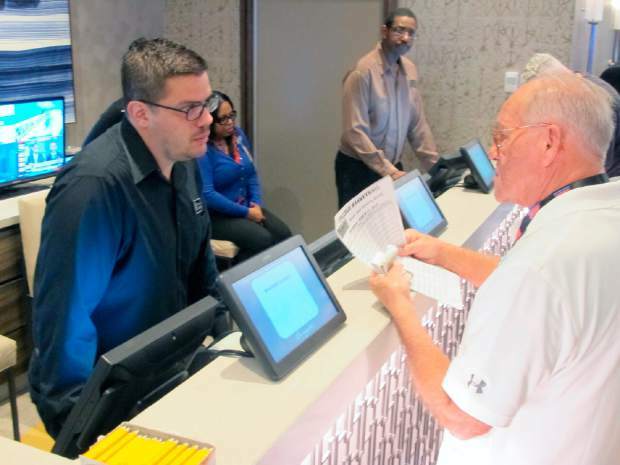 Jimmy Cliff, of Lewes, Delaware, talks to a worker about betting on the NCAA college basketball tournament on Thursday at the Borgata casino in Atlantic City, New Jersey. College basketball fans are lining up at casinos and racetracks, and furiously tapping smartphone screens to get down bets on the March Madness college basketball tournament, in many states where it is legal for the first time. 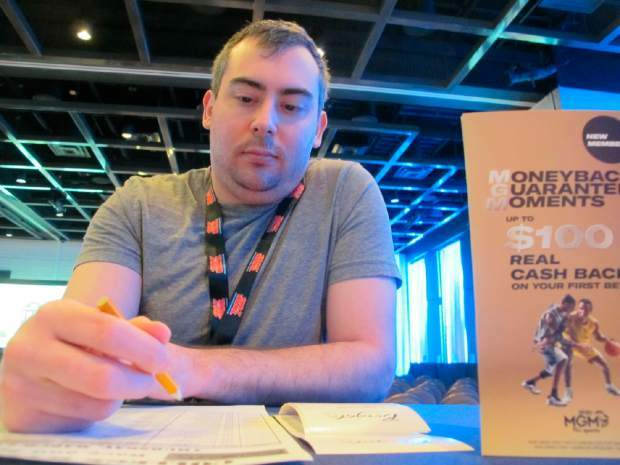 Mike Heusser, of Middletown, Connecticut checks off bets he planned to make on the NCAA basketball tournament on Thursday at the Borgata casino in Atlantic City. College basketball fans are lining up at casinos and racetracks, and furiously tapping smartphone screens to get down bets on the March Madness college basketball tournament, in many states where it is legal for the first time. Randy Atiyeh drove from Allentown, Pennsylvania, to bet on the tournament at the Borgata, picking North Carolina to win.